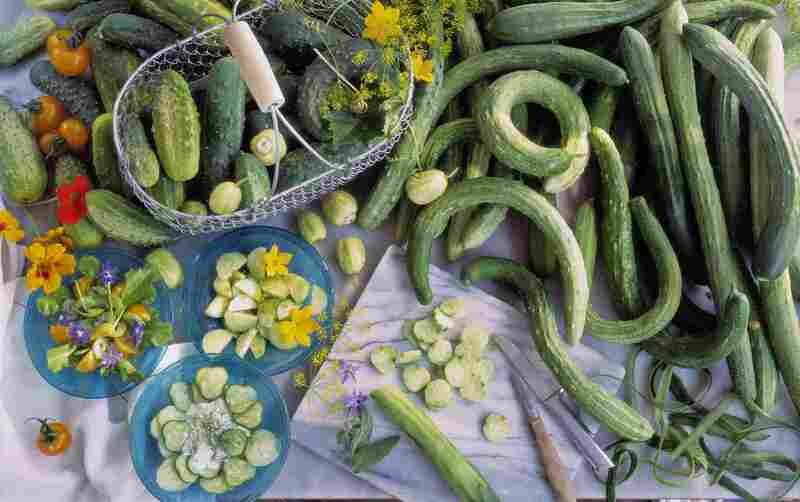 Once available only at the best-stocked farmer's markets, different types of cucumbers are showing up at co-ops, grocery stores, and garden patches more than ever. There are a number of common cucumber varieties—Armenian, English, lemon, Persian—that you may encounter. Not only will this guide help you identify cucumbers, but you'll also get a few ideas on how to use them. One of the favorites is commonly found in crisp cucumber salads. These are quick ways to enjoy cucumbers of all sorts. Armenian cucumbers are long, thin, and slightly variegated in darker and lighter shades of light green or a yellowish-green. They are delightfully crunchy and are delicious when simply sliced and eaten raw. These cucumbers have very soft seeds and thin skin. They do not require seeding or peeling for eating. They are not good for pickling, however, because their softer texture means they turn to mush. English cucumbers are also called hot-house cucumbers and seedless cucumbers. This variety is long and thin with dark green skin. You will often find this variety wrapped in plastic at supermarkets, but you can find unwrapped ones at farmers markets. Despite their alias, these cucumbers do not require a hot-house or plastic wrap to grow. This cucumber has a mild, almost non-existent flavor. It is prized for its thin skin and minimal seeds. Like Armenian cucumbers, English cucumbers are best sliced and raw and are not suitable for pickling. They do, however, work wonders in cocktails. Try adding a slice or two to a glass of sake when it's hot out or whip up a cucumber martini. Garden cucumbers are the most common cucumbers in North America. They are relatively smooth-skinned and dark green. Cucumbers sold at grocery stores tend to be waxed to help them retain moisture. For this reason, you'll want to peel these cucumbers. Un-waxed varieties can be found (particularly at farmers markets), but you may still want to peel them if the skin is thick or bitter. The big seeds in these classic garden cucumbers are why so many recipes call for seeding (or, rather, de-seeding) cucumbers before using them. Once the seeds are removed, though, they're perfect for any recipe. Gherkins are very small—sometimes not even two inches long. If you're looking for a cucumber to pickle, this is a great choice because they'll easily fit in a jar. They are popular in France, where pickled gherkins—known as cornichons—are a classic accompaniment to pâté. Kirby cucumbers are usually short and they're always bumpy. They have a range of skin color from yellow to dark green. Kirbys are wonderfully crunchy for eating raw, but flavorful enough to be perfect for pickling too. Sometimes, they're even sold under the name "pickling cucumbers." Yellow, round, the size of a generous fist, these cucumbers look like lemons, which explains their name. Lemon cucumbers are sweet, without the bitter edge that most cucumbers have. They have thin skins, minimal soft seeds, and are flavorful. Lemon cucumbers are tasty raw and look positively lovely in salads, but they make delicious pickles too. 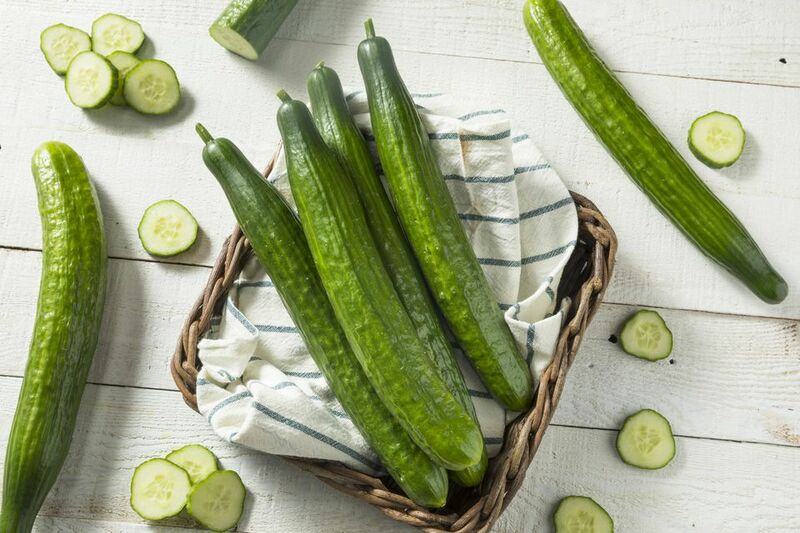 Persian cucumbers are very similar to English cucumbers. So similar, in fact, that they are pretty much visually indistinguishable from fresh, not-wrapped-in-plastic English cukes. A big difference, however, is that Persians come in a greater range of lengths—some shorter, some longer, and sometimes with slightly bumpy skin like a Kirby. Persian cukes have a mild flavor and thin skins. This makes them great for salads or as slices to scoop up dip. They're also crunchy and firm enough to stand up to a bit of cooking—try throwing them in a stir-fry!